We love burgers and are always in search for halal burger joints. So when we found out about On The Bun through Sh. Alaa Elsayed’s Facebook page, we decided to give it a try. 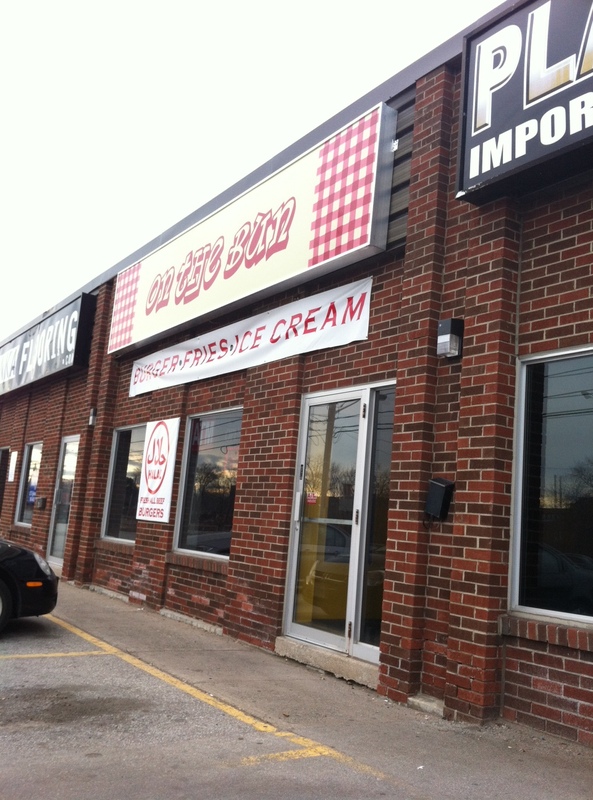 Located in Mississauga, On The Bun is close to Anatolia Islamic Centre. One look at the banner posted outside this eatery and you automatically know that you are in for good, simple food: Burger, Fries and Ice Cream. 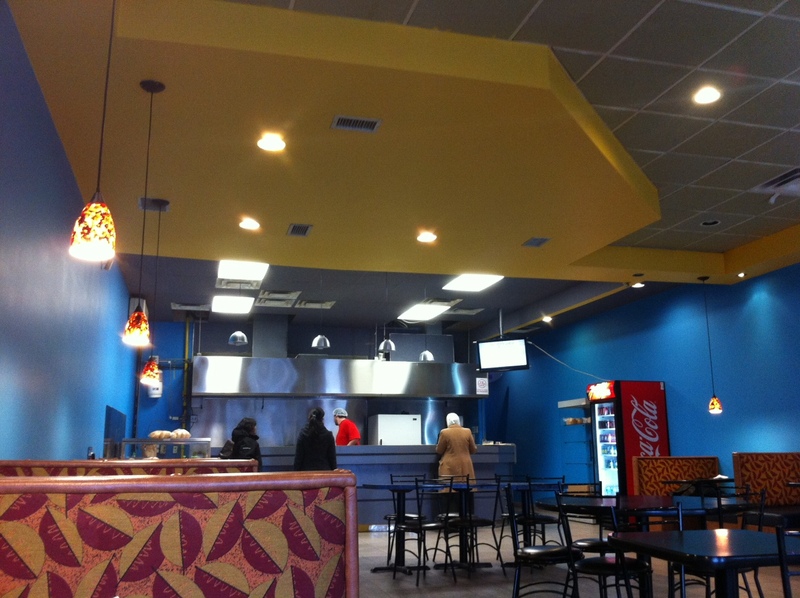 As soon as you step into the eatery, you can’t help but notice how spacious and well lit the place is. The tables were clean, the funky colours were inviting and the overall atmosphere was pleasing. Our table had small double-sided menu cards already there which we grabbed as we decided on what to order. This review is actually based on our second visit to this place. 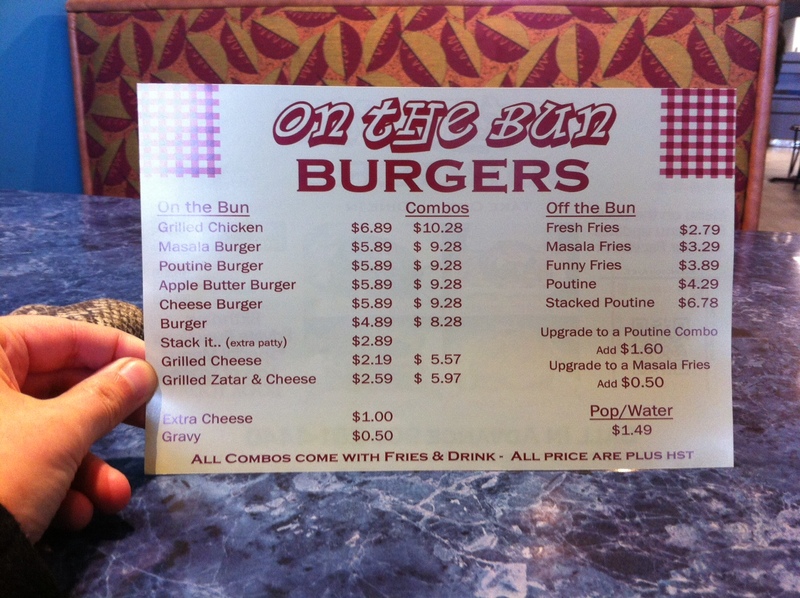 On our first visit we tried the Masala Burger ($5.89) and the Cheese Burger ($5.89). This visit we ordered a Poutine Burger ($5.89) and a Cheeseburger combo ($9.28) for there and also a Grilled Chicken Burger ($6.89) and a Cheese Burger ($5.89) to go. We ordered Funky Fries ($3.89) on the side. Our order was a bit complicated because we got whole wheat buns for a few burgers, different toppings for each burger, some orders without combos and some burgers for there and some for take out. They nailed the order and got everything correct! The food was ready promptly and we couldn’t wait to bite into our burgers. The Poutine Burger had a beef patty topped with gravy and cheese. The gravy in our opinion masked the beef taste of the patty, which is a great option for people who don’t enjoy beef too much. It was a unique combination for a burger and we enjoyed it thoroughly. For the Cheese Burger, we got it topped with lettuce, onion, pickles, mayonnaise, ketchup and mustard. One bite into the Cheese Burger and the burger was an immediate hit! The bun was soft, the patty was juicy and well cooked, and the toppings were fresh. Yum! Cheese Burger at On The Bun. Next up were the Funky Fries. To be honest, when we ordered these fries we did not know what to expect and the only reason we got it was because it sounded interesting. 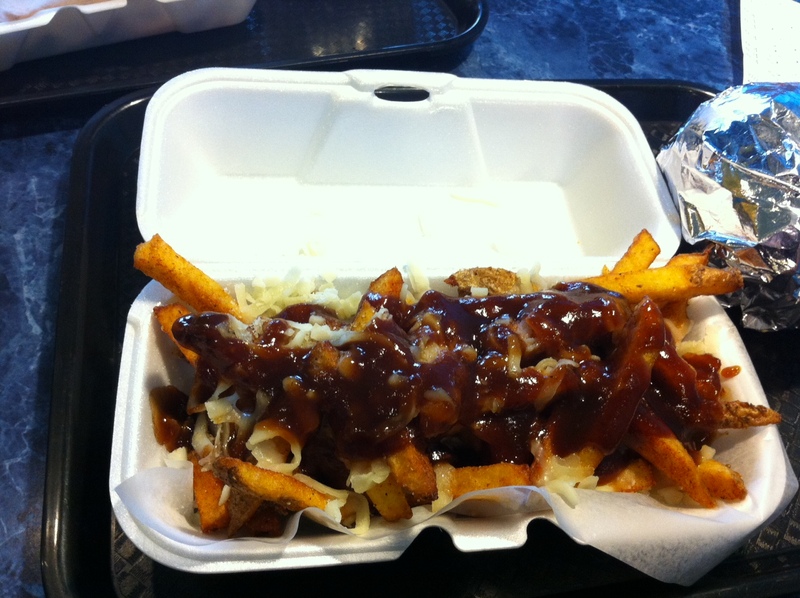 It looked like poutine as it was topped with some sort of sauce and cheese but the taste was nothing like poutine. Excited to try it, we took one bite and the initial unanimous verdict was: interesting. The fries were actually sprinkled with a spicy paprika-like powder and topped with their sweet Apple Butter Sauce. The more we ate, the more the Funky Fries grew on us. The combination of the sweet sauce with the spicy kick was unique but delicious. In the end, we loved it! We were given a complimentary order of Grilled Zatar and Cheese to try. It looked like a breakfast sandwich. 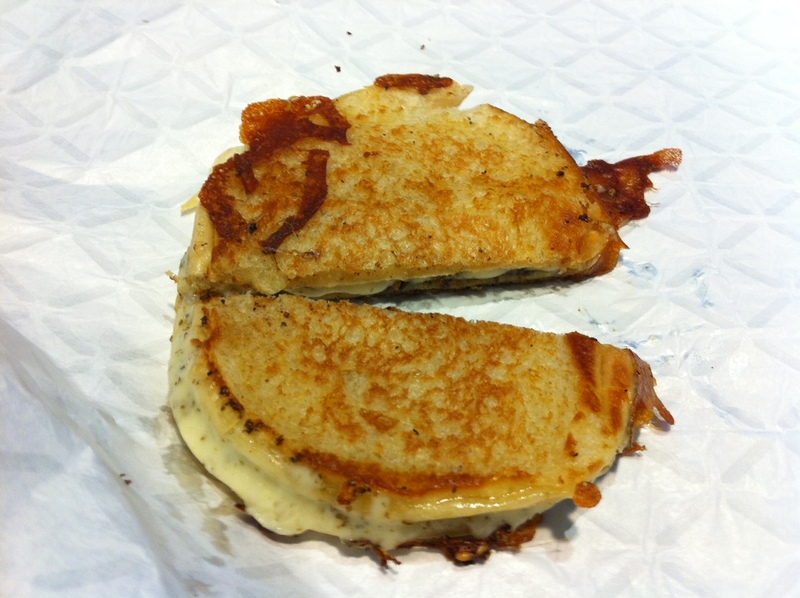 After trying it was an amazing version of a grilled cheese sandwich. The Zatar, which is a Middle Eastern spice mixture, was amazing with cheese. We are not sure what kind of bread was used but it was thin and crispy from the grilling. 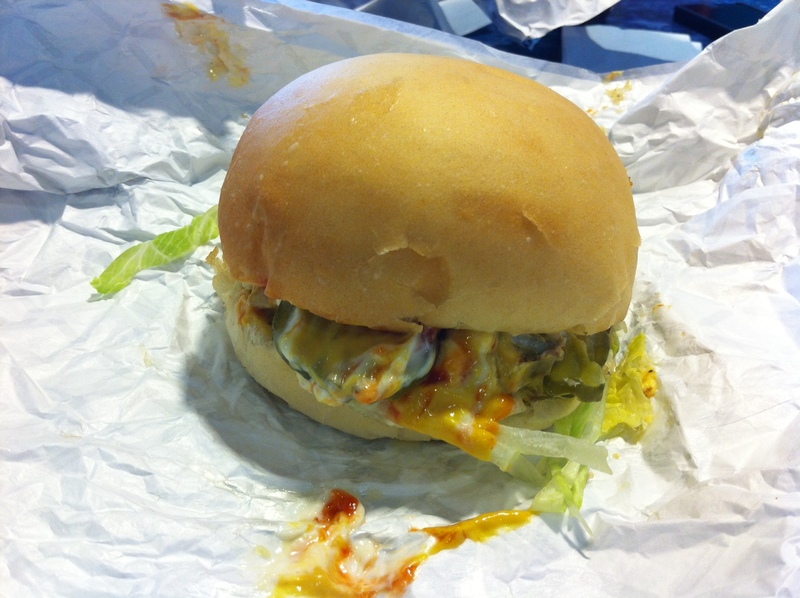 This was actually one of our favourite items from On The Bun and we highly recommend it. The owner Muhammad prepared our burgers himself and was prompt with his service. He was friendly, pleasant and courteous and we wish all the best for his business. 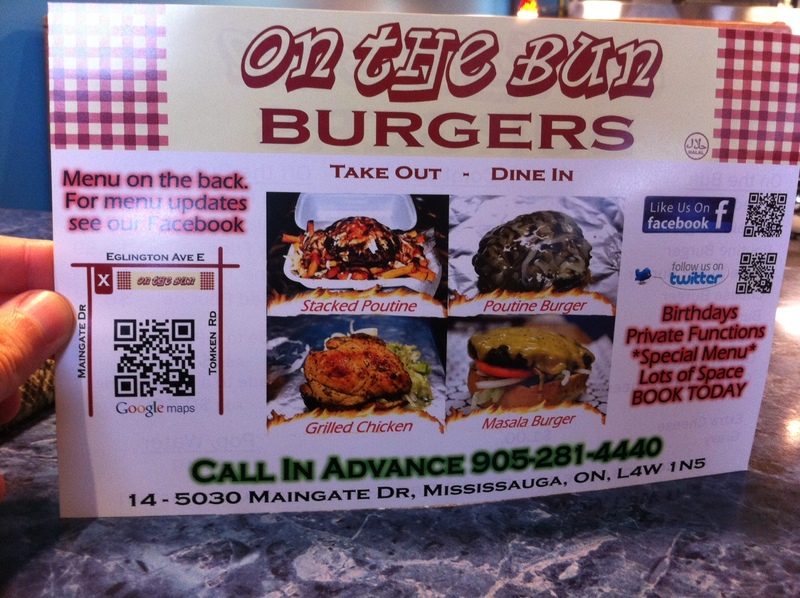 Uncle Iqbal has a $10 for $20 worth of food deal for On The Bun, which is not to be missed. Overall, we highly recommend this place to all burger lovers out there as there are lots delicious and unique burgers to try. So the next time you are in the west end of the city drop by On The Bun and you will not be disappointed. Categories: Restaurant Reviews | Tags: Burger, Burgers, fries, GTA, Halal, Halal Food, Halal Restaurant, Mississauga, North American Food, Toronto | Permalink. 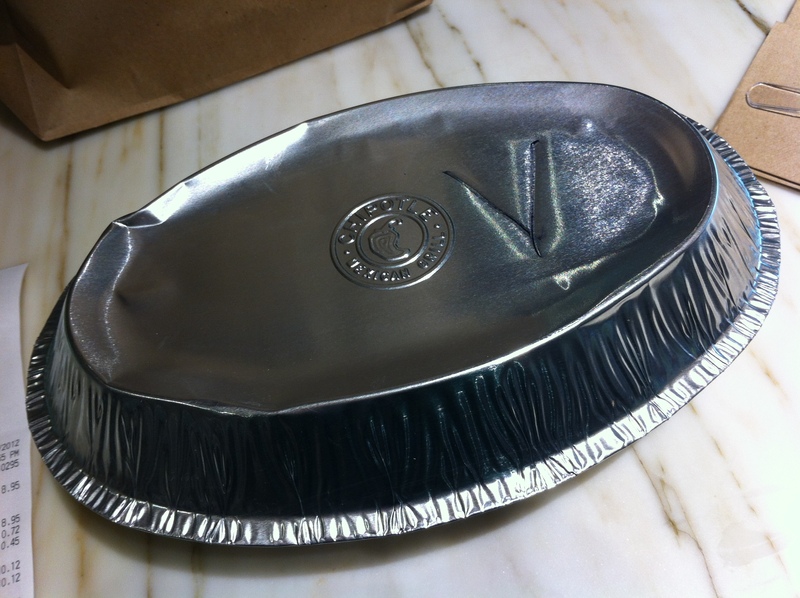 Chipotle is one of those rare eateries that everyone in our family likes. 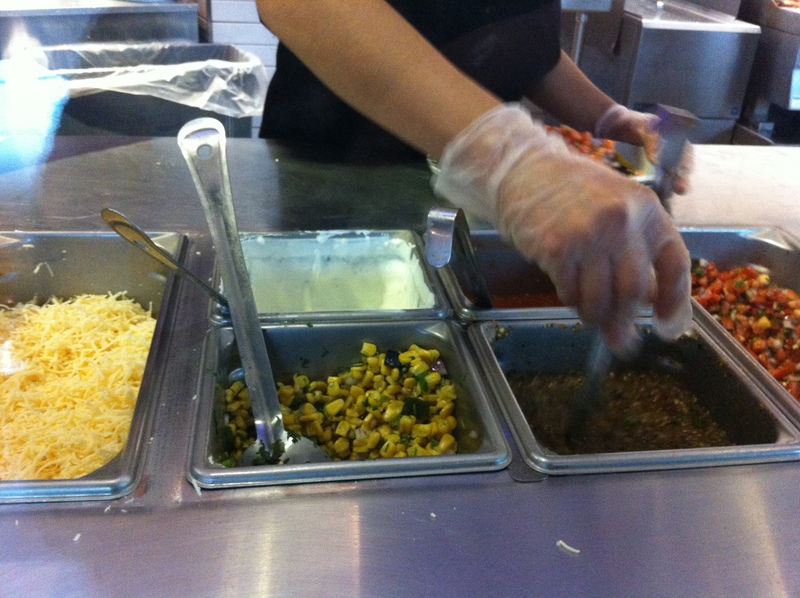 We have been to Chipotle many times now and always find the food fresh, healthy and delicious. The funny thing is that we always get the same item: The vegetarian burrito bowl. Please note: The meat is NOT halal. The servers wear gloves when handling the food which is great. You can ask them to put on a new pair of gloves if you want. From right to left, there is chunky salsa, hot salsa (which is server is getting), mild salsa behind it, corn, sour cream and cheese. And voila! The delicious burrito bowl is ready! The best part is that you get to customize your bowl. So if you don’t want salsa, you don’t have to get it. Don’t like sour cream? Skip it. The food always tastes fresh and wholesome. We particularly like the combination of warm and cold in the bowl: the grilled vegetables are warm but the sour cream is cold. It’s a wonderful combination in our mouths! Just to reiterate ourselves, the meat is NOT halal at Chipotle. We always stick to vegetarian options. Their cheese is vegetarian based (according to their website) which is awesome. Please note that the pinto beans used to be seasoned with bacon but are NOW VEGETARIAN. Please see below for details. The vegetarian burrito bowl is $8.95 and with taxes it comes to around $10. On first glance the quantity of food might not look like a lot but it’s quite filling. It’s great for takeout too! 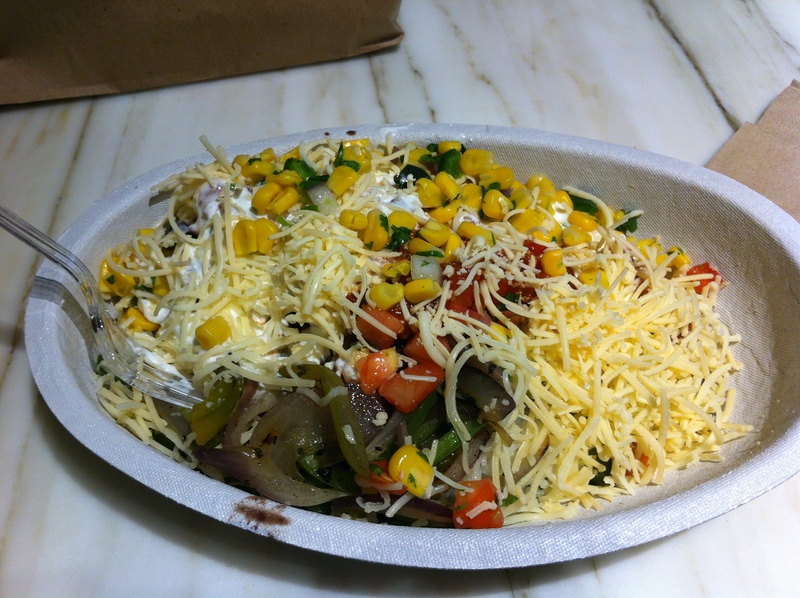 We have visited Chipotle locations in Toronto, New York City and Buffalo and find the food to be consistently good. In Buffalo, they served the food on stainless steel platters and had lemon wedges to go along with the food, which we thought was a great touch. – They don’t fill up your bowl enough. They will not automatically add corn, lettuce and some of the other toppings to your bowl even though it’s included in the price so you need to ask for it. They will only put one kind of salsa for you but you can ask them to put all the different kinds if you want. We usually get the hot salsa (like a paste) and mild salsa (chunky!). – It’s very hard placing the order at Yorkdale. The Yorkdale Mall food court is crazy busy and it’s sometimes difficult to place your order. It is likely that the servers will not hear your order correctly so you need to keep an eye on what’s going in your bowl. So the next time you’re in mood for vegetarian food and want something with a bit of a kick, try the vegetarian options at Chipotle Mexican Grill. “Thanks for writing in to us today! Our pinto beans are indeed free of bacon or pork products. We made the switch to vegetarian pinto beans earlier this year. You’re right, the site should be updated, and I will be forwarding this to our IT specialists to ensure we get this right. Thanks so much for bringing this to my attention. 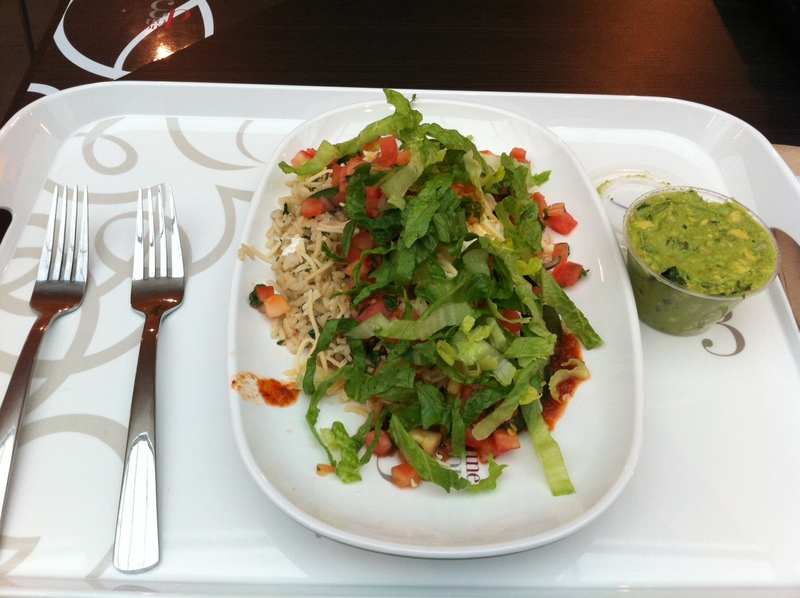 Categories: Restaurant Reviews | Tags: #halalcheese #vegetarian #mexicanfood #healthy #delicious #yorkdalemall | Permalink.